Update 6/14/18: The Skulason home is for sale at $1.6 million. Marketing materials state clearly, as required: The house could be demolished. Could be. Hopefully not. Watching this one. If you’ve never read Ralph Friedman’s books, get to it. His first self-published (before it was called DIY) book, Oregon For the Curious, cost $1.95 in 1965 and sold thousands of copies. If roadside places he covered back then were lost or almost lost, you can be sure that the hand-drawn maps he used and places he covered have long been paved over. 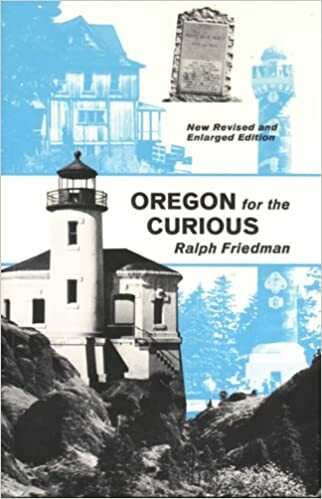 His books are a joy, a tad esoteric, but primers for all kinds of cool and goofy Oregon history—and they’re pretty much at every used bookstore across Oregon. Visitors to Milwaukie sometimes ask for a walking tour brochure but there isn’t any; not that much of interest to see. Still, town has a few encouraging footnotes. However, in its defense, much of Main Street is still intact with shops and restaurants. And digging deeper, I’d have to start to disagree with Friedman on the lack of interest comment. If you dig a little deeper you’ll find all kinds of cool things, like a hidden lake park, an old grist mill, and the former site of Crystal Lake Park—a former dance hall, zoo and amusement park—demolished in the 50s for an apartment complex called, you guessed it, Crystal Lake. Milwaukie is a mix of “former locations” and some still standing. But, buried and hidden between 1950s tract homes, you can still find a gem. Like the Bardi Skulason home. Skulason’s home has been described as a fine country home, where he “devoted his leisure to the growing of fruit and flowers.” It’s also a pretty nice looking piece of architecture, described accurately as Colonial Revival, built in 1913. Snuggled behind Providence Milwaukie Hospital, the homes sits, safe from developers and probably curious seekers like you and me. It does represent, however, some of the history that still exists in Milwaukie and its next-door neighbors, Oak Grove, hanging on as testaments that history is everywhere, and like Friedman and his books, you just need to be more curious and dig a little deeper. Posted in Design and Architecture, Milwaukie, Oak Grove, Oregon, Oregon History, Oregon Main Streets, Portland architecture. Met Ralph around 1980 after I moved to Portland he was doing field trips. You’d sign up thru Portland schools non-credit classes pay a little and go out and explore close to Portland areas for a Saturday couple of hours. Visited the ghost towns of the lower Columbia river. And the areas over by shears bridge very colorful guy. Yep, Ralph’s book turns up everywhere. But, if you really want to know Oregon before exploring it, start with the rail lines (after the pioneer era, most towns center their front door at the depot). It all branches out from there. Start with “The Southern Pacific in Oregon” as the main spinal column of the State (hard to find, $$$, worth getting) and maybe vol. 2, the Pictorial addition (rare, very$$$). Add some Edwin Culp books Caxton, Bonanaza…all easily found). Anything you can find on the electrics and smaller lines as well as local histories (Images of America series are turning up 2nd hand). It’s not until after 1916, that the highways start to dominate the direction of peoples lives and where they locate things. Only then, does the perspective begin from the passing roadways. Thanks for posting about Milwaukie, moved here a couple years ago and have been slowly unearthing the bits of history, didn’t know that the oaks pioneer church was here, what a loss! We live around the corner from the Bardi Skulason home and were always curious about it as it’s completely surrounded in foliage and has an air of mystery to it, excited to dig in and learn more about it! The Milwaukie Museum is a cool gem here – check it out. See ya during Design Week! Thompson’s Willamette Valley Railways give a bit of background. A stop on the original Oregon & California, Milwaukie (nee Milwaukee station) becomes a central host to shops and storage for the East Side Railway (very first inter-urban system in America). With the growth of the town, the main station is moved after the streetcar facilities shift to Sellwood. Pretty much eclipsed like Junction City once everything shifted to Eugene.